"The Family Just Got A Little Stranger"
In this sequel to the 1991 comedy The Addams Family, the extremely quirky family is back, this time dealing with a new baby and the appearance of a sketchy nanny. Raúl Juliá, Anjelica Huston, Christopher Lloyd, Christina Ricci, Carel Struycken, Jimmy Workman, and Christopher Hart star. 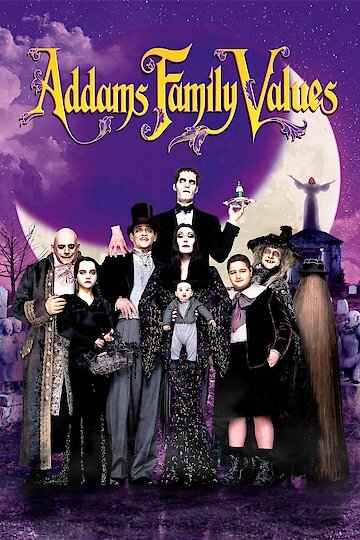 Addams Family Values is currently available to watch and stream, download, buy, rent on demand at Amazon Prime, Hulu, FlixFling VOD, Amazon, Vudu, Google Play, FandangoNow, iTunes, YouTube VOD online.